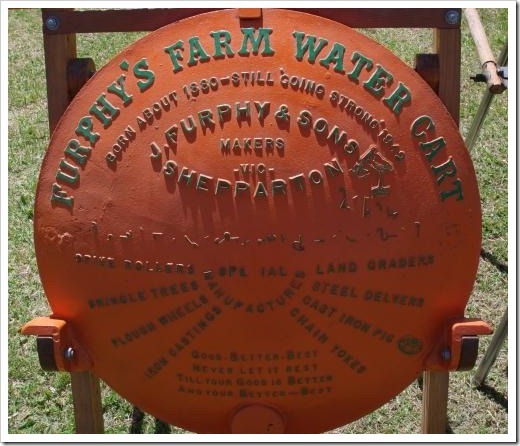 I spotted an Australian icon at the Kyabram Show – a Furphy Water Tank [^] end. 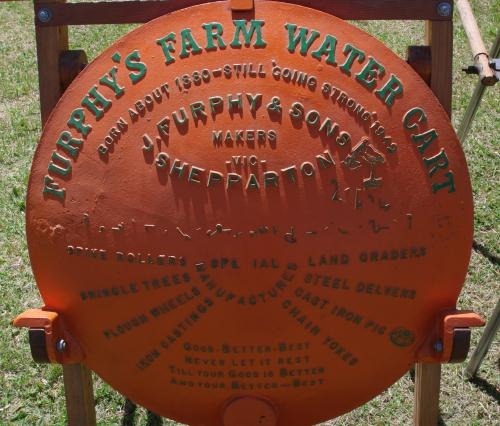 The Furphy water cart was an early exercise in branding. One of the key parts of the brand was the “Good, better, best – never let it rest – till your good is better – and your better best” seen here at the bottom of the end. The Pitman shorthand [^] across the middle of the tank says “Water is the gift of God but beer and whiskey are concoctions of the Devil, come and have a drink of water”. The additional Pitman section between Shepparton and the middle band has Billy Hughes [^] slogan “Produce and populate or perish” – one of the main concerns in Australia in the middle of World War 2. The water cart gave rise to the term “Furphies” – information of a dubious nature, some might even say rumours!